I had a very busy week and I'm looking forward to a not so busy weekend. The only thing I know for sure that I have to do is take my younger 2 for pictures tomorrow. I'll spend the rest of my time getting my papers together for our Accountant and prepping for next week's class....maybe I will be busy LOL!! 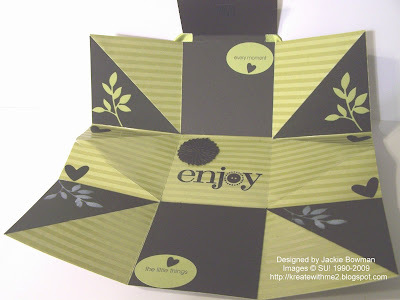 Anywhoo, this is the project that we're doing today as part of my Fun/Funky Folds series of classes. Isn't this the cutest thing?!! I got the idea from my gf Mary--thanks Hun!!! Make sure you stop by and say HI to her! I had so much fun putting this together but now that I'm done with it, when I re-make this; I'll be sure and use our new heavy weight DSP....I'm thinking Parisian Breeze! Don't get me wrong; I LOVE this new Rockabilly paper---the colors and glossy accents are AWESOME--- but I have a heavy hand when it comes to scoring so I split my paper a couple of times LOL! I have some small pics of my kiddos that I can add to this before I send it off to my Aunt...I'm sure she'll love it and overlook my mistakes!! Well, I'm off to get the kiddos going for school, exercise, freshen up and be ready for class! Thanks so much for stopping by and have a great rest of the day!! OMGosh! I love that purse and the sentiment is ADORABLE! I, too, have a heavy hand when it comes to scoring...I think I get used to having to push down so hard to cut, I just do that for the score blade too...LOL...too funny...and lovely project! WOW Jackie! This is fabulous. I've never seen anything like it. Hmmm, you've piqued my interest. Will definitely check it out. See? And that's ONE reason why I love your blog! Have a fabulous Friday. Can't wait to see what you post tomorrow! Very sweet! I haven't seen a purse made like this one before, very clever! 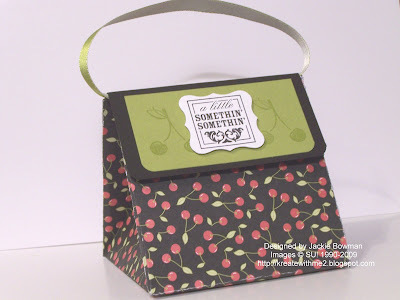 Jackie, love the surprise of this purse when it unfolds! Terrific! Wonzers, Jackie. This is fantabulous! Love it!! Wow,this is different, never seen one made like this before, love the DP too. WOW Jackie!! What a fab idea!! I love this!! TFS!! How cute is this! This is brilliant! Love the DSP and this purse is absolutely mind boggling beautiful! Terrific! Your purse came out sooo cute. I just love this and yes you are right I had to change to a heavy paper too. Hope you have a great weekend. Wow - that is really cool! I like the outside sentiment and its really neat when opened. Now this is super, Jackie! What a great idea and I love the colors you used!! This IS cute! Great job! I'll bet your Aunt loves it! WOW this is so cute! 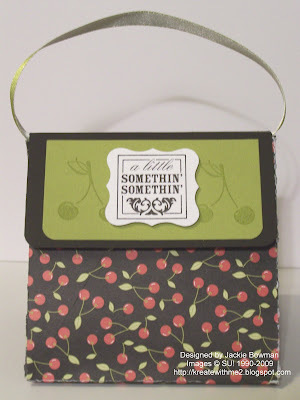 i will totally use this as a hostess gift next week-thank you for teh great idea!!! HELLO! This is incredible! You are too amazing! Great Job! its GORGEOUS...your aunt will LOVE it! Holy moly Jackie! This is FABULOUS! I love it! This is so different than all of the other purses I have seen. Love it!! What a neat, and fun idea! It looks great! I am sure it will be a big hit at your class! This is too cute! I'm sure your aunt will love it. Looking forward to geting to know you on the Etsy Team!!! You have some great stuff on here!! !